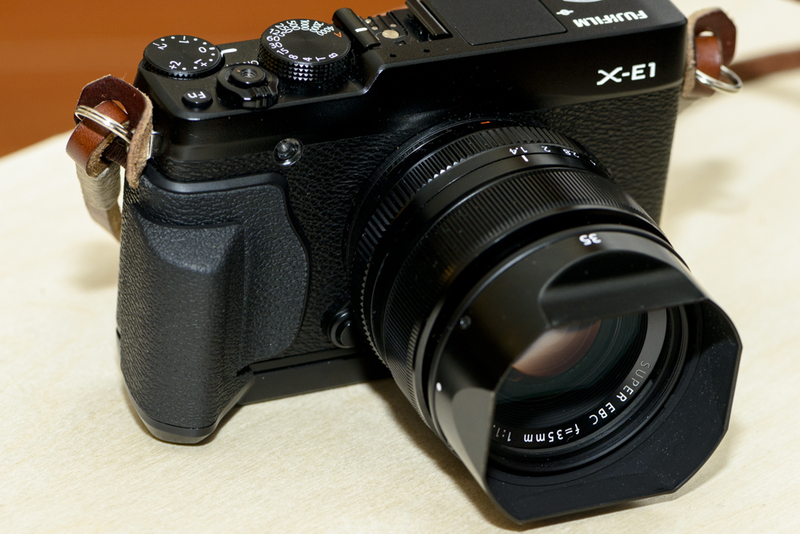 It’s been a month since adding the Fuji X-E1 to the workforce, for the most part it’s been a good experience. I will say in low-light or backlight situations auto-focus is tricky, as well in low-light the EVF’s slower refresh rate makes it hard to keep up with fast moving subjects. I’ve used the X-E1 in tandem with my D800E for a few jobs, and they seem to compliment each other well. The colour that the X-E1 produces right out of the camera is much better than the D800E, especially skin tones. It is also nice to use a camera that doesn’t intimidate people. I found the X-E1 grip to be on the small side. I could never get a solid hold on the camera, especially when trying to shoot the X-E1 and the D800E together. Poking around the web for different grip options, I found most aftermarket versions are half-cases, which I’m not very fond of. I ended up buying the Fuji HG-XE1 hand grip, though I’m not sure why it’s so expensive. The hand grip makes the camera more ergonomic for me. I can comfortably shoot one handed and not have the camera feel like it’ll slip. The HG-XE1 adds just under 3/4 inch to the bottom of the body that allows it to sit better in my palm, and the little bit of weight that is actually welcomed. The only draw back is you have to remove the hand grip to access the battery and memory card, it’s not as big of a deal as you might think. Back on the plus side, the hand grip does move the tripod mount inline with the lens. 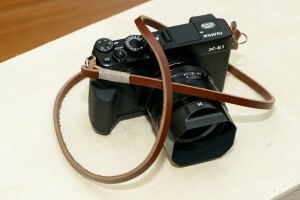 Lastly I found a simple brown leather strap at Gordy’s Camera Strap. The great thing about Gordy’s straps (yes, Gordy does make them) is that they are custom. There isn’t a standard length of strap, you have to specify how long or short you would like it. He has 4 different leathers, 10 different colours of wax thread to accompany your strap, and 3 different bumper options if you want to protect our camera. I’m impressed by their attention to detail, as well as their customer service. Check out their tumblr to see a variety of customer’s cameras with Gordy’s straps. After a month I’m very happy with the Fuji X-E1. With the results I’m getting, plans for the upcoming Fujinon 23mm and 56mm are definitely in the works. Unfortunately I am not going to be able to shoot the X-E1 solo creative before the end of the year, just have to wait till next year. Oh, one more thing. 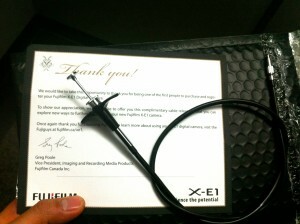 Out of the blue Fuji Canada sent me a cable release as a thank-you for buying an X-E1. Pretty impressive. Now a cable release isn’t the biggest or shiniest product in the world, but it speaks volumes about Fuji Canada’s commitment to customers.